After James Harden sustained a brutal elbow to the head from Metta World Peace shortly before halftime on Sunday against the Los Angeles Lakers, the Oklahoma City Thunder returned for the second half scoring like crazy, quickly establishing a big lead. But the Lakers were not deterred. They got the lead down to single digits with less than five minutes left in the game. The Thunder were unable to make a few baskets in crunch time, and their tendency to tighten up in close games was on display — a critique that has dogged them all season long. Who is responsible for these troubles? The Internet places all the blame on Russell Westbrook, and I understand why. He’s not a true point guard — he looks for his own shot just as often as he tries to set up his teammates. He does make some curious decisions — which he did Sunday against the Lakers — but he’s not solely responsible for the team’s problems. Kevin Durant and coach Scott Brooks shoulder some blame, too. The way they failed to close out the Lakers demonstrates just what they generally do wrong in crunch time and what they should be doing more of. Note: I realize that the Thunder were shorthanded without Harden, but the problems I saw go beyond this one particular game. The problem is that Durant is open for a catch-and-shoot, but he doesn’t take that jumper. Instead, he dribbles into a contested pull-up jumper. Leading up to the shot, everyone has executed perfectly — Westbrook, Perkins, even Durant gets open like he is supposed to. He needs to better exploit the defense and take those open jumpers. Durant also needs to improve at playing off screens when he is the ball handler. He does two things wrong: He leaves way too much space between himself and the screener, Russell Westbrook, and he doesn’t attack the basket. Ebanks is able to stay in front of Durant, and the play becomes an isolation situation where Durant is forced to try to break down Ebanks. With the game tied, the Thunder get the rebound, bring it over half court, and go for the final shot without calling a timeout. Durant goes one-on-one against Ebanks as the rest of his teammates stand and watch. Just because you aren’t calling a timeout, that doesn’t mean that you can’t run a set. Westbrook has the basketball, Durant sets a screen for him, and as he pops out, Perkins steps up and sets another screen. Durant makes the catch. This kind of play requires a lot of trust in your players — everyone has to execute flawlessly to ultimately get the ball in Durant’s hands — and Brooks has the right roster for it. 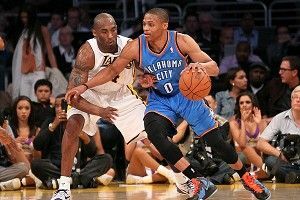 Most coaches who prefer isolations do so because it guarantees that the superstar will have the ball for the final shot. But this set is very simple and unexpected for late in a game, and it accomplishes the same thing. Sefolosha moves from the near-side block to set a screen for Durant at the opposite elbow. Durant uses that screen and flashes to the block, but he can’t get free. 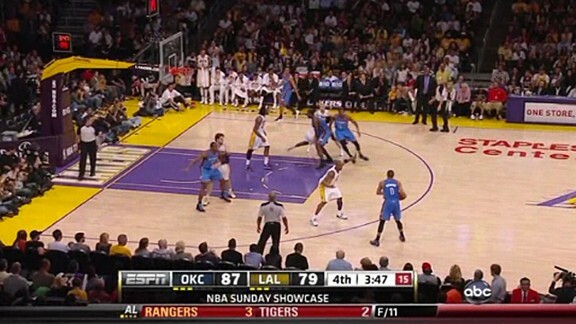 Westbrook panics a little bit, passing the ball to Perkins to avoid the five-second call. Westbrook quickly flashes off of him, gets the basketball back, and takes a contested 3. My problem here is what Brooks has Durant doing. Westbrook could have hung on to the basketball a little longer and tried to get it to Durant. Even if he had, they still would have settled for a turn-around jump shot. Brooks should have gone with screen-the-screener action. Have Durant set a back screen for Ibaka, followed by Durant coming off a screen set by Perkins. The defense would have multiple scenarios to worry about. Again, it’s something simple — which is all you need with a player as talented as Durant — but it can be extremely effective. Too many times last year, Durant would come off a screen like this and float out behind the 3-point line. This time, he’s curling with a purpose, looking for the basketball as soon as he comes off. However, this time Westbrook holds onto the basketball too long and doesn’t get it to Durant at the right moment. By the time Westbrook makes the pass, Ebanks is in position to get his hand on the basketball and knock it loose. Durant recovers the ball and has to settle for yet another contested jump shot off the dribble that clangs off the rim. The Thunder are running their more standard version of the off screen–ball screen set with Perkins setting a screen for Durant, who uses that screen to get in position to set a screen for Westbrook. This set succeeds in bunching up the defense. Durant doesn’t even get a body on the man he is screening, but it doesn’t matter. The goal is to get Ebanks to hedge off Durant, and that is what happens as Westbrook comes off the screen and tries to get to the free throw line. With Westbrook attacking, Durant comes off his screen and rolls to the front of the rim. With all of this action, you have the lane open for an easy dunk to tie the game. The problem? Westbrook’s pass isn’t precise enough. It’s slightly behind Durant, and that gives Ebanks a chance to make a play on it, which he does: He turns his body around and gets his hand on the basketball, creating the turnover and a fast-break opportunity that results in two game-clinching free throws. Brooks called the right play and Durant moves well without the basketball, but two off-the-mark passes (and they weren’t even that far off) means that the Thunder were unable to get the bucket they needed. The Thunder’s late-game struggles aren’t just one person’s fault. It isn’t always the play calling, it isn’t always Durant’s inability to get in position off screens, and it isn’t always Westbrook’s poor passing/decision making. However, when all their weaknesses converge on the same play, you get ugly basketball. A perfect example of that is a possession that took place in the fourth quarter with the Lakers clawing their way back into the game. Here, Westbrook brings the basketball down the floor and Perkins comes up and sets a simple ball screen for him. 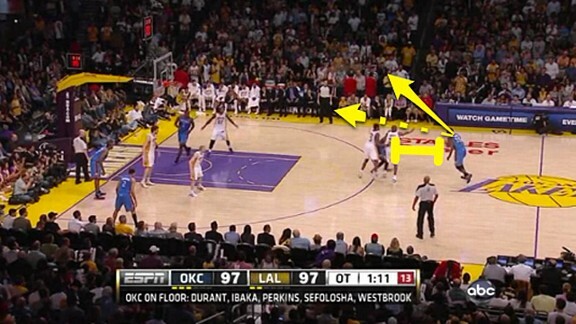 Jordan Hill, who is defending Perkins, skillfully hedges the screen and keeps Westbrook from attacking the rim. As Westbrook gets forced to the corner, the Thunder show poor spacing. This would be a perfect time for Durant to back-cut, but instead Durant stays in the corner as Westbrook doubles back and comes off another Perkins screen. Hill’s strong defense forces Westbrook about 10 feet behind the 3-point line. The hard hedge leaves a man open, but in this case it was Perkins, and he is not a scoring threat. Durant raises his hand and calls for the basketball even though he isn’t open. To try and salvage the possession, Perkins sets a third screen for Westbrook. This time he’s able to get to the free throw line and Durant is open in a spot he likes behind the arc, but Westbrook pulls up for his shot, misses it, and the possession ends without a single pass. Westbrook could have made a better decision or passed the ball at some point, but the possession is not entirely his fault. His coaching staff could have called a better ball screen for him. The screener should have been Ibaka so that the less-athletic Gasol is showing on him. (Although after this possession, Brooks ran two straight Westbrook/Ibaka PNRs and got four points out of it.) Durant also could have done more: Instead of waiting for the ball to come to him 30 feet away, he could have tried to get in better scoring position. The Thunder do have some strong sets at the end of games — like the shallow-cut play. But those are few and far between, allowing both Durant’s and Westbrook’s weaknesses to show through. 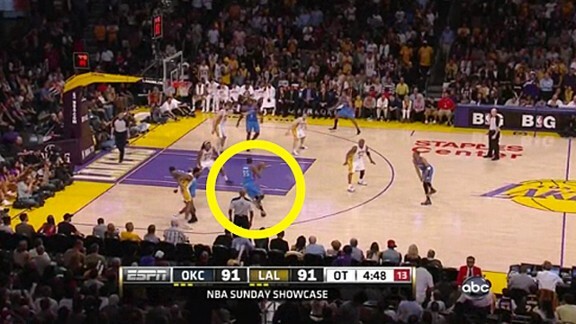 The Thunder could have won against the Lakers even without any adjustments. They could probably even win a championship playing this way. But they could make it so much easier on themselves if they executed better and played to everyone’s strengths, especially when the defense steps up come playoff time.